This peak is particularly impressive when viewed across the abyss of Mám na Gaoithe from Bengower. Braon can mean 'drip' or 'drop', but may be a personal name here. It is the basis of the surnames Ó Braoin and Mac Braoin, anglicised as Breen and McBreen. 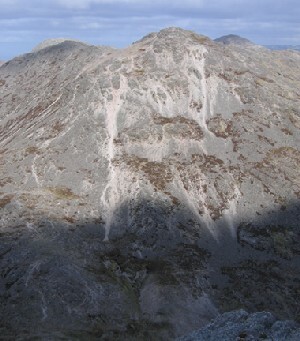 Binn Bhraoin is the 126th highest place in Ireland.